A high quality cycle route on the quays is “something we have to do” a senior engineer with Dublin City Council has said. The route would tie in with off-road cycle paths in the Phoenix Park and the canals route in the Docklands. As Dublin Bikes expand to the Docklands and Heuston Station, pressure is likely to mount to provide the East-West route, but any cycling route which changes the quays is likely to be highly contentious with motorists. 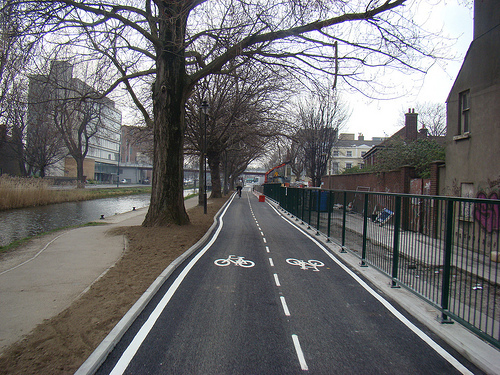 A recently finished cycle route on the Grand Canal… Could a cycle route on the quays look like this? The design work which was allocated funding recently is a follow up from a workshop last year hosted by Dublin City Council and the Dutch Embassy in Dublin, with help from Dutch cycling groups Fietsberaad and the Dutch Cycling Embassy. Engineers at the event came up with a number of concepts, including options for moving both traffic and buses of the north quays – both concepts also improved the route for buses. Both concept cycle route options use a two-way cycle track on the riverside of the north quays. The two options start at the Phoenix Park / Heuston Station, and end at the Point. The routes differ mainly in how traffic and buses are managed at pinch points along the quays. The first route option diverts motorists off the quays at two points. The second route option reverts the south quays to two-way traffic and diverts westbound buses onto bus priority measures on College Green, Dame Street and Christchurch before rejoining the quays after Christchurch. However, at this point it is unclear what the new study will recommend – it may have no link to the concepts. 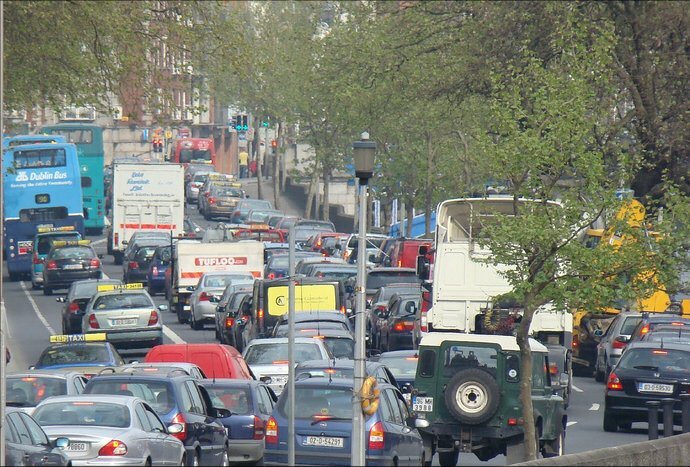 Officials have strong backing to look at the route given that it is included in the Dublin City Development plan, agreed on by councillors and officials. The route would link the Point with Smithfield, and Collins Barracks. This article was originally published in the print edition of Cycling in Dublin in June 2012. ALSO SEE: Dutch-style cycle path on Dublin’s quays? When are you going close of the city to cars and motorcycles at least between the canals and make Dublin decent for people again?